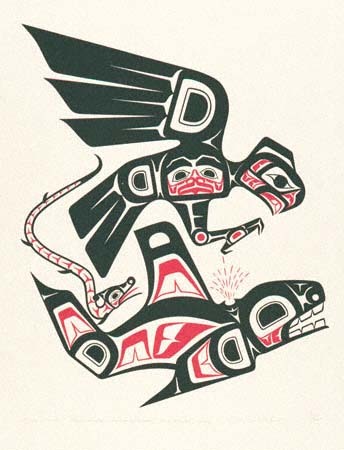 In his work, Sonny Morrison Jr. has portrayed traditional figures from the legends of Tsimpshien, Kwakiutl, Nootka and the Salish. Prints from $250 U.S.
Clarence A. Wells was born in 1950 into the Gitsen Clan of the Tsimpshien. All work on his prints, including cutting of the silk screens and the printing was done by the artist.